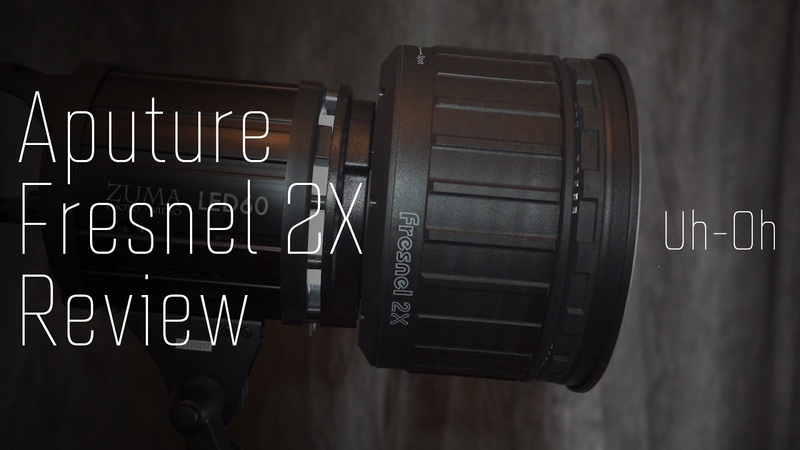 Aputure Fresnel 2X Review: Uh-oh. I’m not usually the first one to buy a new piece of gear. I’ve pre-ordered something maybe twice in my life. 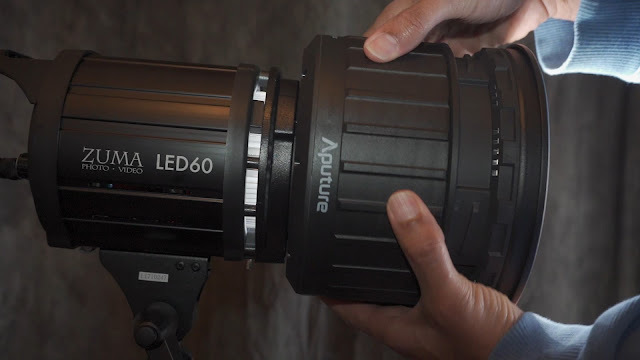 But when I heard about the Aputure Fresnel 2X I thought… this is the kind of design mistake I can get into. I was really excited about the possibilities of this tool. The Aputure Fresnel 2X is designed to fit onto any Bowens mount light and increase its output anywhere from 2 to 14 times it’s maximum. It’s a Fresnel, which means it’s focusable, from 40 degrees to 12 degrees—at least according to the literature. It’s a design mistake, in my opinion, because it essentially turns any cheap 60-100 watt light into a monster, able to compete with the likes of the thousand-dollar Aputure 300d. Of course, I was wrong about that… and that’s a big problem. Aputure implies that this will work with any Bowen’s mount light, and to be blunt, it doesn’t. I don’t own the Aputure 120d, the light it was specifically designed for, so I don’t know how its construction differs. But in my tests with two cheap lights, the Zuma LED60 and the RPS Studio 100 watt light, the unit just doubled the light, increasing by one full stop. Now that’s not bad, and it’s within Aputure’s claims, but that wasn’t the only disappointment. On the RPS Studio, it failed to act as a Fresnel. The beam didn’t widen or narrow—it stayed at what I suspect is about 12 degrees. On the Zuma I did get it to open up some, but not to a full 40 degrees. 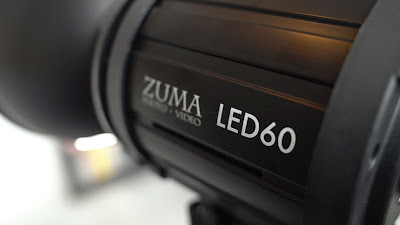 And the Zuma light had another problem: you could make out the bi-colored LEDs when the Fresnel was zoomed in. Really ugly. Now you may think, “well, it does double the light so it’s worth it.” But the 12 degree angle is a problem. You can’t really shoot it into a scrim or bounce card, because the beam is too small at 3-5 feet away. To fill up the card, you have to back the light even farther, thus reducing the amount of light that reaches your subject. This takes away the one stop of light you gained. Remember, if you double the distance between subject and instrument, you half the amount of light. And 12 degrees is less than a third of 40. The beam is so narrow at that distance, that I suspect it will even have problems in a softbox, when used on a third party light like the Zuma or RPS. It’s also a pretty big attachment, so it’s not something I’d want to carry around if it wasn’t a flexible tool. At this point, I’d love to see some real world reviews of the light on the Aputure products to understand whether these limitations are just for other brands, or if it doesn’t fully perform up to spec. There’s a reason Aputure makes such a wide claim of “2 to 14 times” the output. The design of the Fresnel 2x appears to be based on a very specific light design. I’m sad to report these findings because I’m a big fan of Aputure. They make quality goods at a decent price. But the Fresnel 2X isn’t something you can use on non-Aputure products, and that’s extremely limiting. Leave me a comment if you’ve had success with the 2X on other third party lights. The Godox SL60 has been called the Aputure 120D killer. But can the Zuma LED60, a lesser known knock-off, kill the Godox? That’s a lot of light deaths already. 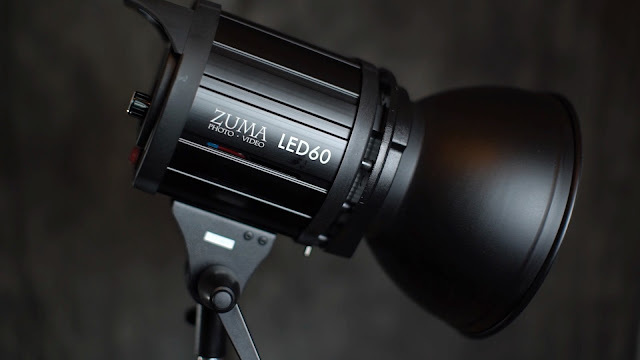 I was thinking about getting the Godox as a cheap secondary light, when I came across the Zuma LED60. At $85.46 including shipping and tax I thought… why not? To be fair, I don’t own the Godox or the Aputure, so this isn’t a comparison video. But the questions about value are the same, so here we go. The ZUMA is a quote-unquote "cheap Chinese knock off." But that doesn’t necessarily mean its lower quality. Almost everything is made in China, so Chinese companies have the option to pick and choose higher and lower quality goods to design the product—and price point—they want. Too often, we think about the value of a light only as a key light. For a good key, we need excellent color, silence, power, and flicker-free illumination. Portability and ease of set up are helpful, too. But we don’t need great color or silence on our rim, ambient, or environmental lights. If it's not serving as your key light, the thing a secondary light has to be is flicker-free. I use a lot of different light-- large lights, midsized lights, small lights of varying quality throughout a set. So I was willing to experiment with $85 to see if the Zuma had a place in my kit. The Zuma is a daylight balanced LED that actually has a great form factor for this type of fixture. It’s really small, just slightly larger than its reflector. It’s all metal—the only plastic is the back handle and the lever. It doesn’t require a power brick or converter. And it’s a Bowen mount, which allows for professional modifiers. The only bummer is that the light cover is about twice the size it needs to be, taking up extra space when packed. And there is no case for it, which might be handy. I compared this light to my key light, the Falcon Eyes RX 24 TDX. The Falcon is a high quality, powerful light that I personally love, despite the ridiculous power brick and portability issues. To my surprise, at full power, the Zuma matched the light output of the Falcon Eyes. At three feet, I metered ISO 200, shutter 60, and an aperture of 5.6 on both lights. That’s roughly 5300 lux at 1 meter. 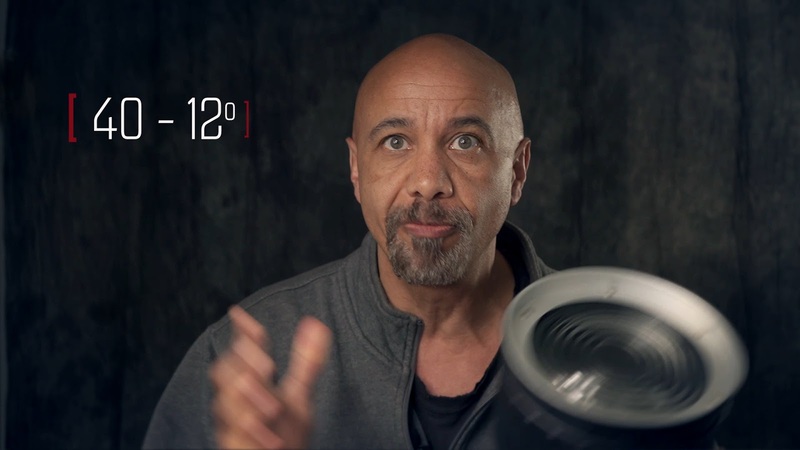 The beam and spread are different, of course, with the Falcon Eyes being a bigger, more flattering light, and the ZUMA hard light that will require a modifier in most situations. I don’t have a spectrometer, so I compared the color on a RGB scope. I filmed this with a Sony a7sii, which is notorious for color shift, so I didn’t expect perfect greys out of either light. Sure enough, my Falcon Eyes dialed into 5600k had higher blue and green levels on the scope. Now the Falcon is known for excellent color rendition, so I believe the uneven RGB lines is due to the Sony. To my surprise, the Zuma had a nearly identical image. 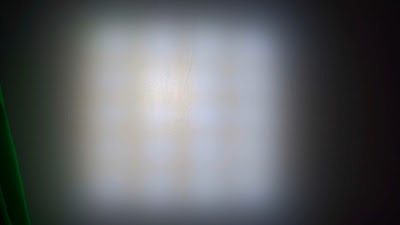 The Falcon is a large panel, so the light fell evenly across the grey card (resulting in a flat line on the scope); whereas the Zuma is slanted due to light fall off-- not color quality. The Zuma, in fact, is closer to perfect grey in the scope. But in all honesty I don't know if there is "too much" red in the Zuma, due to Sony's strange color rendition... other cameras might see the light differently. During my color test, I was standing about eight inches away from the Zuma. I actually had to turn the light back on after the test in order to listen for fan noise. It’s really quiet. Professionally quiet. Unless you've clamped your mic to the light, you're not going to hear it. In a 20 minute heat test at full power, the ZUMA didn’t warm up, either. The Achilles Heel of cheap LED lights is flicker. That’s because cheap LED’s pulse at lower light output in order to reduce the amount of light. They’re really firing at full power, and reducing the amount of light by interrupting the flow. This means that when you shoot at higher frame rates, you can catch the dark portion of the pulse in the frame, creating flicker. I couldn’t recreate flicker with the ZUMA. Even shooting at 10% power and 500 frames per second, I didn’t see any. Which suggests that the ZUMA isn’t using a pulse to reduce output. I haven’t had a chance to use the ZUMA in a real world setting, but I was impressed that it performed so well in a studio test. The ZUMA isn’t just a solid secondary light. It can perform as a key light. The only real question left is durability. Will the light hold up over time? Obviously, the worse case scenario for any professional is to show up on a shoot and have your main light fail. Full disclosure, this is my second light. The first one showed up dead on arrival. This one had an extra fuse in the box, so I suspect the first one had a dead fuse. The light is all metal, doesn’t rattle, and doesn’t heat up, so there’s no real reason to suspect it will fail, but I can’t speak to the internal wiring and components. I probably won’t use the Zuma as a main light just because the $550 Falcon Eyes is more versatile… it's bi-color, and has a soft box attachment. It is possible if I was traveling and didn’t have space for the Falcon, working in hazardous conditions, or I knew I would have only a minute to set up, I would grab the Zuma one instead. As a secondary light, I’m really looking forward to putting this little guy into play at Hurricane Images. In sum, at $85 on Ebay, it’s hard to go too far wrong with this light. It's powerful, silent, small, keeps its cool, and has very good color rendition. It’s a great choice for beginners and professionals who want to add to their kit.